A 16th round pick in the 2016 MLB Draft, South Bend Cubs outfielder Brandon Hughes’ career resembles a roller coaster. The switch hitting outfielder is riding a high wave, right now. In June, the 22-year-old is hitting .364 with 2 HRs and 7 RBI in 15 games. Last year at Eugene, Hughes got off to a torrid start to begin his pro career. That July, he hit .299 with 1 HR and 7 RBI. Then he began to cool off in August as only hit .199. His K rate was at 25% and he only walked 7% of the time. He pulled 43% of his batted balls and only 30% went the other way. Against lefties, he only had 27 ABs but hit .296 against them. Still, I was pretty high on him at the end of the season. I liked his athleticism and thought that it would help propel him in his career. I really liked his hands through the zone and thought that eventually, he was too good of an athlete to fail. Here is what I said in the Leveling Up Series About Hughes in March. The Cubs need to figure out what kind of hitter Hughes is going to be. Is he going to be a leadoff-speed kind of guy like he was at Michigan State? Or, Is he going to be a guy they’re going to try and develop into a power hitter? Will he be the hitter we saw in July or the one in August? Or, is he going to be some sort of multi-dimensional player that has both speed and power? To put it mildly, Hughes did not good off to a good start this year at South Bend. In April, he hit .222 and followed that up in May at .198. His K rates and walk rates were very similar to last year. But something was beginning to change. He was beginning to get more lift. In 2017, only 32% of his batted balls were fly balls. This year, it was up to 42.5% and he was able to go the other way as that rate increased to 35%. 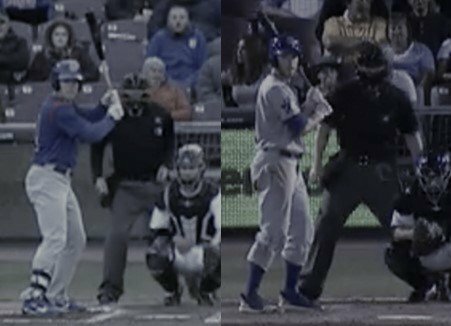 But the biggest change was in his stance. At the beginning of 2018, his hands were extended away from his body shoulder level (see picture below). In May, he pulled his hands in and lowered them to his chest. He seemed to be more upright and he opened up his stance to better see the pitcher and improve his timing. In talking with South Bend Cubs broadcaster Brendan King, Brendan commented that Hughes works very hard at repeating that new swing and stance every pre-game. At some point, muscle memory begins to take over and that is what is happening. At 6’2” and 215 lbs., Hughes has good size and his athletic prowess is helping him repeat his performance. I am looking forward to seeing how he will do the rest of the summer with his new stance now ingrained in his muscles. Right now, Hughes is all systems go and it looks like he’s taking off.